My name is Duncan Lock and I run Codeistry, a small independent web development business in Vancouver. Very small - in fact, it’s just me! Dealing with a small business has many advantages for you. You get direct contact with the person who created your site and wrote all the code, not someone in a call centre somewhere. You always get a personal service and I’m totally fanatical about doing a remarkable job - it’s my reputation on the line every time - if I don’t do a great job, I’m going to suffer for it. I rely on providing remarkable service, so people spread the word. Codeistry lovingly craft elegant websites, complete with full Content Management Systems - putting you in complete control of your own website. I wouldn't want to have to ask someone else to update my website - I just change it when I want - and I think you should have the same power. I create all my sites using standards based XHTML & CSS code, accessible to anyone, on any device, easy to use and easy to find. I specialize in MODx and Wordpress website development, as these two powerful modern platforms give my customers complete control and customization of their websites. All Codeistry designs are unique to your website - I don't re-use designs, so your website will really stand out from the crowd. If you need a website, or any web development advice or consultancy, please contact me now. 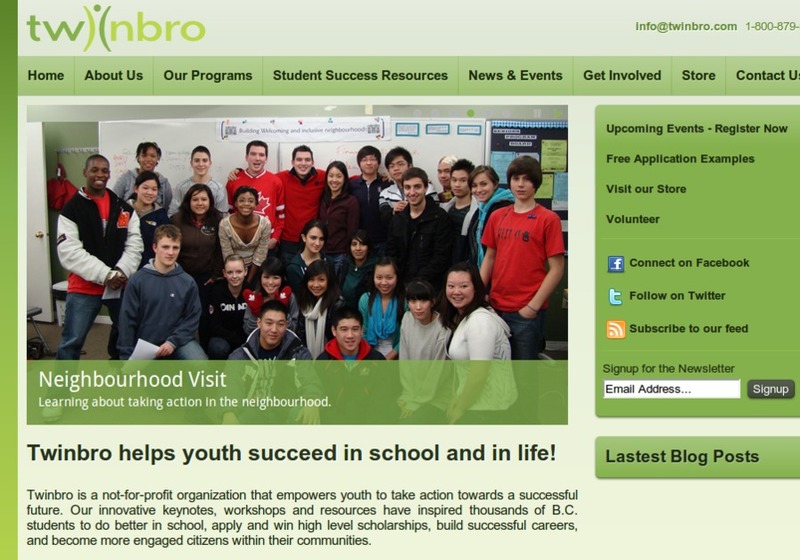 Homepage from the new website Codeistry built with Twinbro, a local Vancouver not-for-profit organization who empower youth to take action towards a successful future.